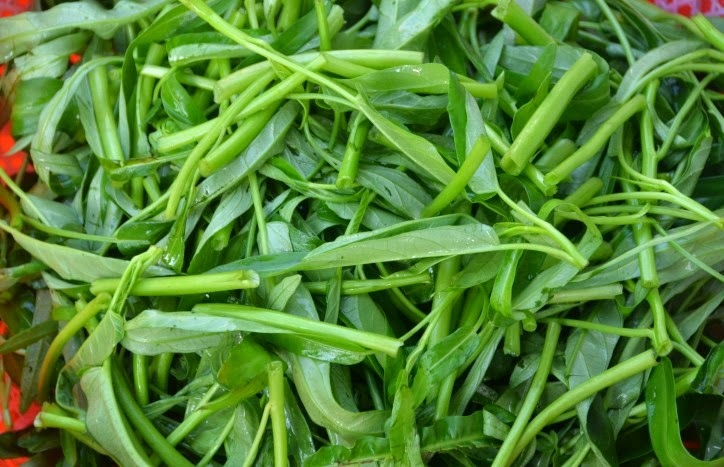 My grandmother's next door neighbor came over with a bunch of tender looking water spinach or rau muống in Vietnamese. He said someone gave him a large bunch and asked if we would like half since it was too much for him and his family. We took half and I must say these are the best looking bunch that I have seen even for here. I picked out a few of the tough parts and any bruised or yellow leaves. I broke each stalk into 2-inch lengths and washed them several times in water. The simple and best way that my family prefers to prepare this is to cook them quickly in garlic. I made this in the past and have added to a previous posting but without any shallots. I have some beautiful looking ones in the kitchen so I incorporated them to this dish. A few shallots make a huge difference in fragrance and taste. 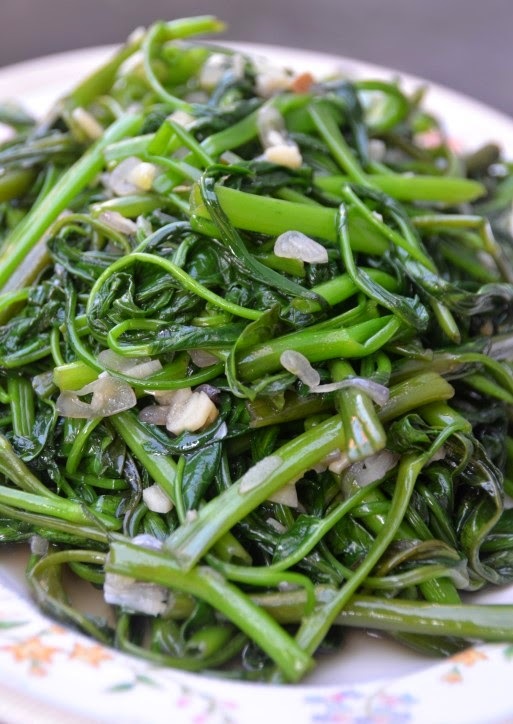 Here is my rau muong xao toi or stir fried water spinach in garlic. 1) Heat a wok or a large pan over high heat. Once the pan is hot add oil. 2) Add garlic and shallots. Saute for about 30 seconds, avoid burning the garlic. 3) Add water spinach. Saute for about 2 minutes or until the leaves and stems are somewhat wilted. 4) Season with fish sauce and sugar to your taste. Saute for another minute and remove from heat.